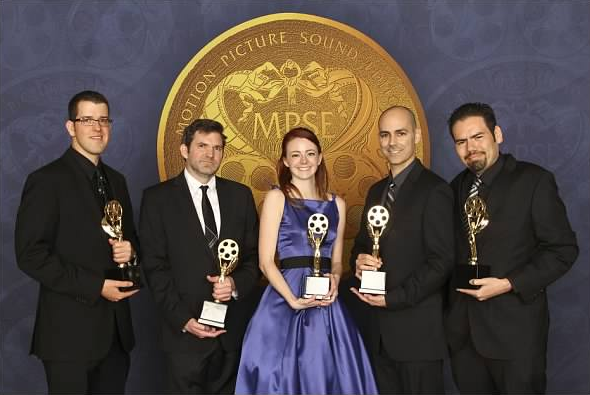 First of all, the MPSE celebrated its 60th year with a spectacular Golden Reel Awards celebration. This year's show honored filmmaker Ang Lee and Foley Artist John Roesch, both individuals I admire for their artistic sensibilities and tremendous contributions to film. In addition, special tributes were held in memory of sound pioneer Norval Crutcher and sound designer Mike Hopkins. Though I'd never met either Norval or Mike in real life, their work was an enormous influence on me, and I am grateful for the roads they paved; roads which I travel down regularly. Thank you Ang, John, Norval and Mike for pursuing greatness in your careers, and for serving as perfect examples of what I hope to achieve in my own. The Golden Reels: SEALed with Thrones! I was nominated for a Golden Reel this year for my participation in four different projects, and I am very excited to report that I brought a statue home that evening. 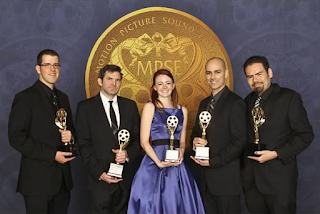 The hard working Monkeyland sound crew and I were honored with a the prestigious award for our contributions to the film SEAL Team Six: The Raid on Osama Bin Laden, an independent, meagerly-budgeted film with a whole lot of guns. Monkeyland and Soundelux sharing a cheer! 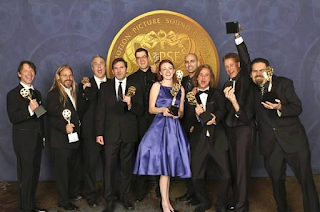 And as if winning weren't amazing enough, the results in the Television Long Form Category actually produced two winners that evening, resulting in a tie between our crew and the sound crew from Game of Thrones, for their work on episode "Valar Morghulis." Now, I've always been one to try and stir the pot wherever possible in order to "keep things interesting," but never would I have imagined an outcome like this. I'm still stoked that we actually shared the stage with the talented folks from Soundelux responsible for one of my favorite shows! Talk about a memorable win! Talk about keeping it interesting! The events from last Sunday's show were definitely one for the history books (at least for my history book, anyway), and I am truly grateful for the attention and recognition that SEAL Team Six has received from our peers. 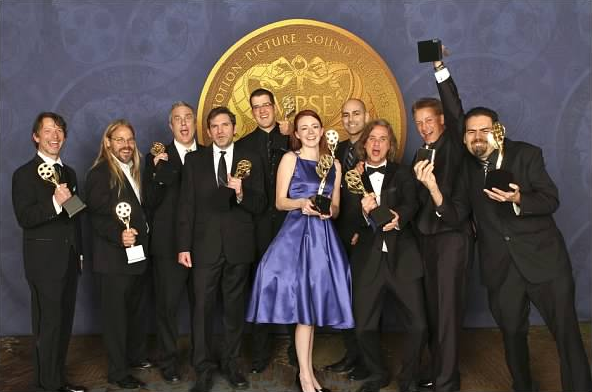 Of particular note, a similar situation occurred last night at the Oscars, where Bin Laden film Zero Dark Thirty tied with Skyfall for the win in the Sound Editing category. I'm interested to see what conspiracy theorists think! My continued thanks go out to SEAL Team's director John Stockwell, Zev Foreman and Nicolas Chartier (the producers from Voltage Pictures), our post supervisors Larry Ferguson and Eric Bergman, the Weinstein Company, Stuart Berkin, producer Megan O'Hara, our re-recording mixers Kelly Vandever and Mark Rozett, my consigliere Mark Lanza, Trip Brock and the editorial & support crew from Monkeyland Audio, and lastly, but certainly not least, the voting community from the MPSE who helped make this dream a reality for us that evening. I feel truly honored and blessed, and wish you each a strong and successful 2013. Workwise, things are look up. I've spotted a film called 10 Cent Pistol, which will hopefully turn over sometime next month. There's another AFI thesis short film called Interstate that we'll be starting on soon, and I'm currently preparing backgrounds for an indy drama titled Beyond Paradise (starring Daphne Zuniga, Yareli Arizmendi and Francia Raisa). I'm grateful to be working and hope the trend continues upward! I march into March with a clear head, a focused mind and a water-like attitude. I wear appreciation and gratitude on my sleeve, mindful of all the blessings that have been bestowed upon me. My goal is to continue putting forth my best effort in everything I do, and to find stronger, more effective ways of contributing to the projects I participate in. As a Monkey, I look forward to continue making strong "music" with my co-workers. As a freelancer, I look forward to stretching my wings more often and collaborating with other industry comrades on their projects. In short, I want to keep stirring that pot and keep life interesting! 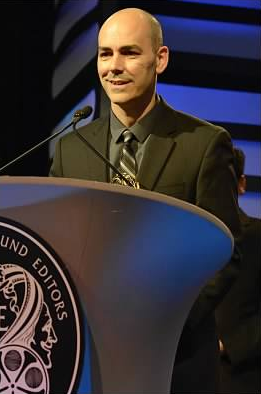 I wish my fellow sound editors and mixers a strong and productive year. May it be filled with insightful and creative projects. Many blessings!